Being small does not necessarily means a sacrifice to the cooling effectiveness. Here are 2 images of the R&D team conducting a field test in the streets of Las Vegas in summer 2008. The temperature on the day was 102.4ºF, with a humidity of 15%. The result: the temperature of the air was cooled by 23.8ºF! How much cooler is the output air exactly? 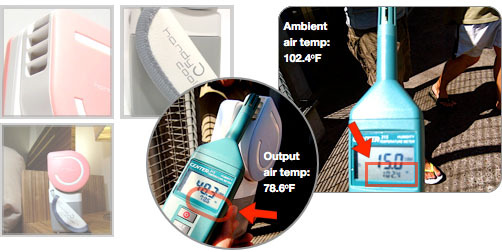 Handy Cooler™ is based on evaporative cooling. 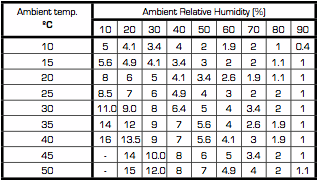 The cooling effect relies on the the ambient/surround air temperature and relative humidity. Looking at the tables below, you can find out how many degrees (C or F) Handy Cooler™ reduces under specific ambient temperature and humidity. 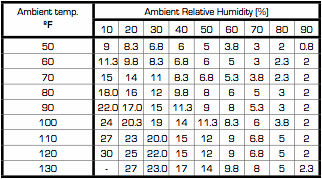 A dry and hot environment (closer to the bottom left portion of the tables) will cool the air more than a cold and humid environment (top right portion of tables). Figures are for approximate guidance only. Actual performance may differ due to uncontrolled factors such as air pressure, fan speed, wetness of cooling filter, etc. Say the ambient outside air is 110F and relative humidity is 10% (typical day in Las Vegas), Handy Cooler™ will cool the air by 27F!! That is a BIG change in temperature for a SMALL device! Wet and humid environments (colored GREEN below) do not allow effective evaporation to take place, therefore not allowing Handy Cooler™ to perform efficiently. Use your own essential oils in conjunction with our cooling filter to deliver your favorite scent together with the blasting cool air! Simply place a few drops of aromatherapy oil on the the center of the cooling filter and you can instantly enjoy Handy Cooler™ doubling as your personal aromatherapy device!